The judges were looking for well-presented innovative menus supported by exceptional food and service. They wanted to see consideration for special dietary needs, leisure industry trends, healthy eating options along with the organisation’s approach to training and development of the food and beverage team. They were also looking for venues with consistently high standards of health and safety, hygiene and cleanliness. “The vision from when we started designing Safari MK 4 years ago was to create something unique both in Milton Keynes and within the indoor play industry. We wanted families to want to come and eat together as well as play. The whole team work so hard every day to keep this dream alive and they fully deserve this recognition” Gordon Forster, Managing Director and Owner. Material Matters and their food and beverage partner, Regency Purchasing Group are delighted to have been working with Safari MK soft play, in the supply of good quality food products, since they opened their doors in 2014. Contact for further information on the supply of food and beverages to your business – Rachel Mould of Material Matters Ltd, email: rachel.mould@materialmattersltd.com or tel: 01252 621114. 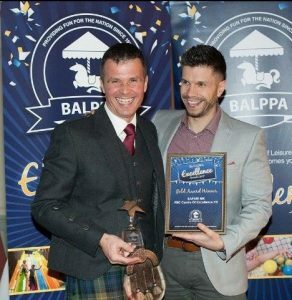 * BALPPA have been supporting the UK Leisure Industry for over 80 years, this leisure association recognised by the leisure industry worldwide and recognised by the British Government prides itself on being a driving force for safety and overall practices of excellence within the leisure industry.